We try to use a production assistant whenever we shoot a Stubborn Old Gardeners video. Your work as production assistant keeps the process working smoothly and helps speed up the location of film clips during editing. Before the shooting, the videographer will send you a link to the script we will be using. Take some time before the shooting begins to familiarize yourself with it so you have the big picture of the video we’re producing, the order of the shots (usually in the order they will appear in the finished video), and the equipment we will be using. Dress for comfort (including protection from the sun if we’re shooting outside). Unless the videographer has asked you to appear in the video, you will not be on camera for any production shots. Take your copy of the script with you to the production site, and show up a few minutes early so you can get to know the site. Be aware of where we can access power and/or water if needed. Write down a shortened version of the name of the video in the blank for “Director.” This won’t change during the production. Write down the scene number and the take number for each take. If the scene is one where the talent is speaking to the camera, write “T” in the “Roll” blank (stands for “Talent”). If the scene is one where the talent is speaking voice over and we are simply shooting a demonstration shot, write “VO” (stands for “Voice Over”) in the “Roll” blank. Be ready to hold the slate board in front of the talent’s face with two hands when the videographer calls for “slate.” Speak up loudly and confidently the shorthand version of the name of the video, the scene number, and the take number; as in “Perennial Veggies, Scene 4, take 3.” Then bring the top bar down onto the bottom portion of the slate board to produce one loud, sharp slapping sound. 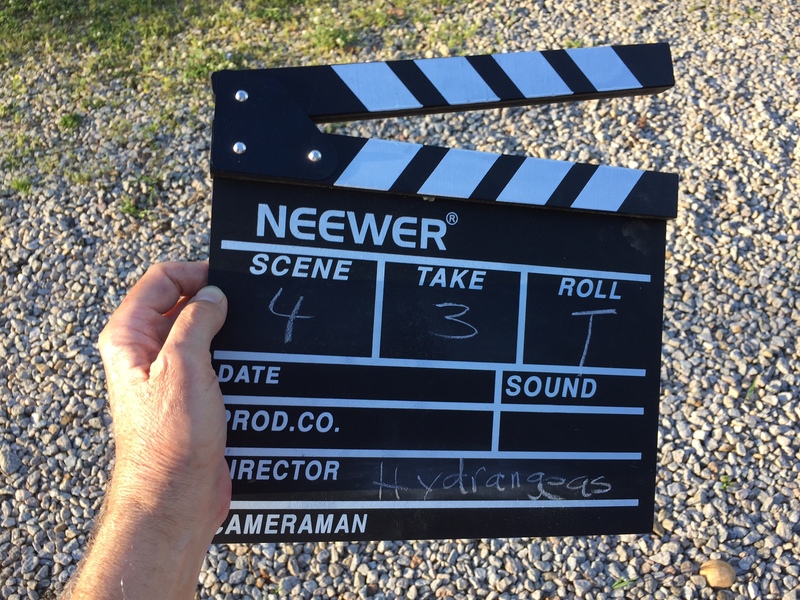 During post, the editor will use your slate board to locate takes, as well as to synchronize the video with the audio, so it’s important that the full slate board be on camera and in focus when the slap occurs. It’s also important that the slap occur within close range of the talent’s lavalier microphone. As soon as you announce a take, change the take number to the next one up so that it’s ready for the next take. That is, if you’ve just announced “Scene 2, take 3,” immediately erase the “3” and write in “4” so your slate board is ready for Scene 2, take 4 if it’s needed. If you become confused about which take it is, don’t fret about it, just guess high. That is, the difficulty of going from take 3 to take 5 without a take 4 is nonexistent. The difficulty of dealing with two occurrences of take 3 is considerable! Each time we finish a scene, unless the videographer instructs you otherwise, the last take will be the one we use. So write that take number on your copy of the script. There is one other function you perform as production assistant. The professional term for it is “continuity.” It basically means you make sure that one shot doesn’t look inappropriately different from the next shot. So, for example, if the talent is holding a trowel in her right hand when she finishes speaking, you wouldn’t want to jump in the next shot to her holding the same trowel in her left hand. Or if the talent has a pen in his pocket for one shot, you wouldn’t want to have that pen gone in the next shot. As production assistant, you can help the videographer and the talent by being aware of these little glitches that might make our videos less smooth. Thank you for serving as production assistant. Your work is critical to CAMGA’s teaching function!